After strenuous activity or sauna, the skin welcomes revitalization. Birch Arnica Energizing Body Oil’s refreshing minty-lemony scent awakens the mind as nourishing plant extracts join jojoba oil to maintain moisture balance for soft, supple skin. Tired muscles are soothed and warmed for a feeling of greater comfort and flexibility. Formulation: Birch leaves, arnica, burdock root and stinging nettle are combined with sunflower oil then carefully blended using unique rhythmic processing methods to allow the properties of the nurturing plants to be transferred to the oil. Awesome revitalizing and energizing body oil! After I exercise I come home, take a quick shower and lather myself with this magic oil with arnica. You can almost see the thirsty cells drinking this magic oil, nourishing the skin, refreshing the moisture balance for soft, supple skin. My tired muscles are soothed and warmed for a feeling of greater comfort and flexibility. Still skiing at 65 as I live in the mountains of Colorado and this is what I’ve always done for the last 33 years. 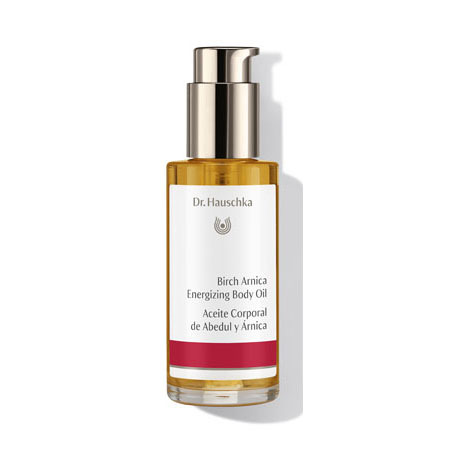 At this age my knees & shoulders need extra care and the Dr. Hauschka’s Birch Arnica oil gives me great relief as it penetrates deep into those sore muscles & ligaments. The best product I’ve ever found . This oil is comforting to my muscles as I am an athlete, and perfectly hydrating for my skin which tends to be dry. It does not leave an oily residue. Instead, it is readily absorbed and leaves my skin soft and plump. I do not use it on my face. This is so easy to use and works immediately to smooth and refresh wherever you choose to put it on your body. Helped with leg cramps walking around Amsterdam. Excellent for sore muscles. Arnica helps achy places but it is a scent hard to love. 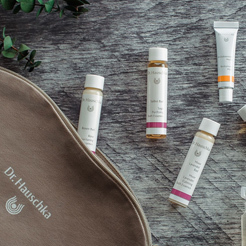 Dr Hauschka has the combo right and I am grateful. I absolutely love texture and smell and everything about this product! I love the exotic scent of this product and it really does what it says it does, my skin feels energized and has an overall sense of well-being. I love using it in the morning, but vary between all the body oil scents depending on the day. A little expensive for what it is, but I do love it. I decided to try this product out on a whim, and I am so glad I did. I've used it after workouts as I find it really makes my legs feel great afterwards. Also recently, I decided to try it while I was pregnant to cure those terrible achy legs....and it worked! I'm just going through it rather quickly, so I'm not sure I'll buy it again at the current price. I use Birch Arnica Oil after a strenuous activity, like rock climbing or water skiing, and my muscles relax and kind of warm up. It is a wonderful oil to put on after a shower after a long, stressful day. It works for me! I love the texture and smell of this product. It's also not too oily, and sits well on my skin after applying. Excellent , light, aromatique oil. Use it after a work out for sore muscles, also helps with bruises. I love to knit and sometimes do it to extremes. It is great to have this Birch Arnica oil to apply to my sore hands and arms! This product line is the best in the business. I've been in the skin care industry since 1986 and most of my colleagues agree. It is a good product with special scent. I use this on sore joints, it moisturizes and does seem to help inflammation. My only complaint is I think it could be a little stronger. Release tired muscles after strenuous exercise. I love the scent of this oil and find it relaxing. I frequently use it before, after and during long flights or trips of any kind to both relax and increase circulation. It is also great to use post working out. Their stuff must be made in Heaven! Birch Arnica oil. What can I say. This smells heavenly, as does all of Dr. Hauschka's stuff that I have bought throughout the years. I suffer from depression, and their stuff smells so good, it lifts my spirits, not to mention, makes me look young too! I've been using their products for nearly 30 years now and I'll tell you that they have precisely what I need to feel and look young and makes me feel good about myself. Can't ask for more than that. Thank you Dr. Hauschka!! Perfect for massage before and after exercise or strenuous activity.